Helpful tips and clothes dryer diagnostic advice below with troubleshooting suggestions for the Do-It-Yourselfer. 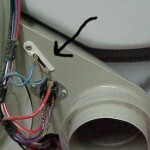 See photos of common Whirlpool and Kenmore clothes dryer repair techniques. GE, Maytag, Amana, Magic Chef and Frigidaire electric clothes dryer. 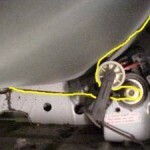 The diagnostic help out lined below is intended to be used only by professional appliance repair technicians. If you are attempting to repair your clothes dryer yourself, be aware that you are working with potential dangerous electrical currents that can cause serious injury or death. Be aware that appliance parts have extremely sharp edges and moving parts that can cause serious injury or death. Always remove/disconnect the power source from the unit you are working on. Unplug it! When unplugging or removing the power source, double check to make sure you removed the proper cord or turned off the proper breaker. When tightening or loosening parts make sure that if the tool you are working with or your hand slips, you will not be injured by sharp or jagged edges. Always keep children and pets away from working area and disassembled washer parts. Be aware that there are other hazards involved in appliance repairs besides those listed above that may cause serious injury or death. Use extreme caution when installing or removing parts. A common malfunction is the dryer thermal fuse – when it gets too hot it will cause the dryer to cease/stop running and will not start again. These thermal fuses are not on all clothes dryers, they are found on most dryers made since 1986.
toward your particular make or model electric clothes dryer. Disconnect The Dryer From It’s Power Source! then use a stout putty knife or regular wide screwdriver to pry the lid up. then remove the two screws on the inside of the cabinet, one on each side. See red arrow on the third picture below. These instructions apply to some dryers that do not have a kick plate on the bottom of the dryer. Some newer models you may have to flip the console faceplate back to remove screws that allow you to remove the top and then remove front panel. Disconnect the unit from it’s power source! 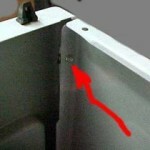 After removing the screws (red arrow) pull the panel toward you a couple of inches, then lift up. Check breaker box in the house. Electric (220 volt) dryer has two 110 volt circuits, the motor will run but will not supply voltage to the element if one circuit is not on. This is usually a 30 amp double throw breaker. Flip off and on a few times to test even if it looks like it’s on. This is a common problem, especially in the summer. Dryer runs does not heat. Dryer running, is not heating. Motor tries to start – makes a buzzing noise. Whirlpool and Kenmore repair diagnostic tips. Dryer runs – makes loud clunking noise. Dryer motor runs – the drum does not turn. Heating element stays on after the dryer shuts off. Dryer takes too long to dry. 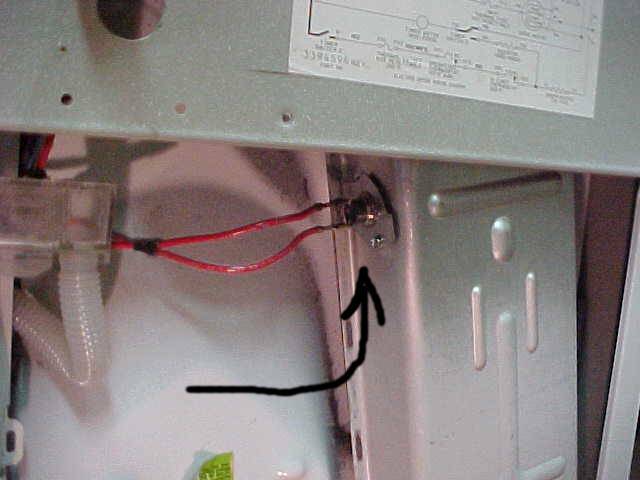 Replace the element (dryer heating element should show continuity with ohm meter.) Looking at the back, the element is located on right hand side in a long metal housing (on most older models). The housing must be removed from unit and element must be removed from the inside of the housing for inspection. 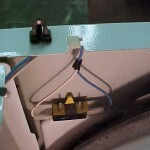 The heating element housing has a 3 1/2″ metal strap at the top that secures it to the dryer, The strap must be removed. Most common element part # 4391960. Thermal fuse is blown. Located in the back. The back cover must be removed. This thermal fuse should show continuity when checked with an ohm meter. Dryer replacement part # 279769. Dryer hi limit thermostat may be blown. This t-stat should show continuity with an ohm meter provided it is cool. Most of these limits are either 250 degree shut off (L250) or 290 degree (L290) older models. T-stat limit part is located near bottom of heater housing. Operating thermostat may be blown. This t-stat should show continuity with ohm meter provided it is cool. This t-stat limit is located on blower housing. If there is only one limit it is usually a 145 degree limit (L145). Older units may have two or three limits. These are usually dryer repair parts (L135), (L145), (L155). Dryer thermostats. Switch on the dryer motor is defective. Temperature switch on the console is defective. Solid state circuit board is defective. (dryer main control board). Dryer power cord is defective. 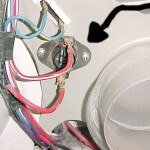 Terminal block (where the power cord is connected to the dryer) is shorted out. Wiring shorted at the terminal block, or elsewhere. Improper voltage supplied to the power cord (house current). Make sure the dryer is plugged in and has proper voltage. Operating thermal fuse is blown – This thermal fuse should show continuity with an ohm meter, oval type part # 3390719. rectangle type Part # 3392519. located in back of the dryer on the blower housing, this picture shows the (rectangle) type. Older models have the (oval) type, both types are made of white plastic. Door switch defective. Replace with part # 279347. Switch is on the right hand (front). Older models may be located in center. 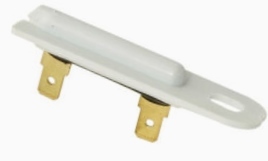 Lever that actuates dryer door switch may be broken or bent. Replace with part # 279347. 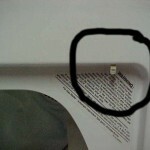 Dryer is not plugged in. No voltage at wall socket. Terminal block shorted or wires shorted else where. Wires shorted at the terminal block. (where power cord connects to the dryer). Solid state circuit board defective. (Main Control Board). Push to start switch defective. Note: This is probably the least likely reason dryer will not start. If the switch is made of clear plastic and you can see residue inside where the points have been arcing, this is normal and does not signify a bad switch. The switch when depressed should show continuity with an ohm meter. Motor tries to start – makes a buzzing noise when the Push To Start Switch is activated. 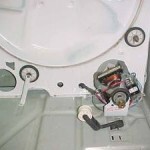 Whirlpool and Kenmore dryer repair diagnostic tips. Dryer motor may be defective. (most probable). Blower fan may be obstructed. Seized idler pulley or drum rollers. Rear drum seal is shredded, hung up on the rollers or elsewhere. Shorted wiring or bad terminal block. Drum rollers are worn. – (most probable cause). Part # 349241t. Idler pulley is worn. Part # 691366. Front or rear drum seals is defective. – (rare). 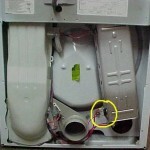 More pictures that show the inside and back of your Whirlpool or Kenmore clothes dryer. 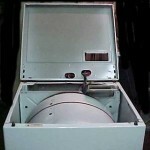 Dryer motor runs – but the drum does not turn. 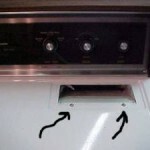 Your Whirlpool or Kenmore dryer may be easy to repair. Belt broken – (most probable). Dryer idler pulley broken or dislodged. Idler pulley installed in the wrong position. Dryer motor pulley is loose. Heat element stays on after the dryer shuts off. Heater element coil touching heater element housing. Vent hose has kink in it. Interior house vent pipe clogged at roof or elsewhere. Flap on exterior vent is stuck or clogged. Lint filter not cleaned after each load. Dryer door not closed properly. Defective operating thermostat, (L145) is most common. Defective hi-limit thermostat, (L250) (L290) are most common. Defective timer – defective temperature select switch. Intermittent operation of above electrical parts. Restricted air flow, interior cabinet air flow system. Washer not spin-drying clothes properly. Heater element housing loose from bulkhead. Dryer drum rollers & idler pulley.